Won in competition in Autumn, 2013, the three-storey facility embraces the Trust's vision to lead world-class healthcare for children and young people and provides a warm, friendly, innovative and open environment that is non-institutional and that increases public awareness of the facility. The building complements and sits within the existing masterplan, maximising the site's footprint to create a feeling of spatial generosity within a porous and light-filled interior. Its corridor-free interior encourages interaction and collaboration between researchers and visitors and establishes multiple connections between the adjacent Hospital, the neighbourhood and the Park. A curvilinear central atrium is formed by a series of open yet intimate spaces and contains voids, bridges, meeting and write-up spaces and garden terraces. It acts as a serpentine extension of the Park, bringing planting and light into the heart of the building. 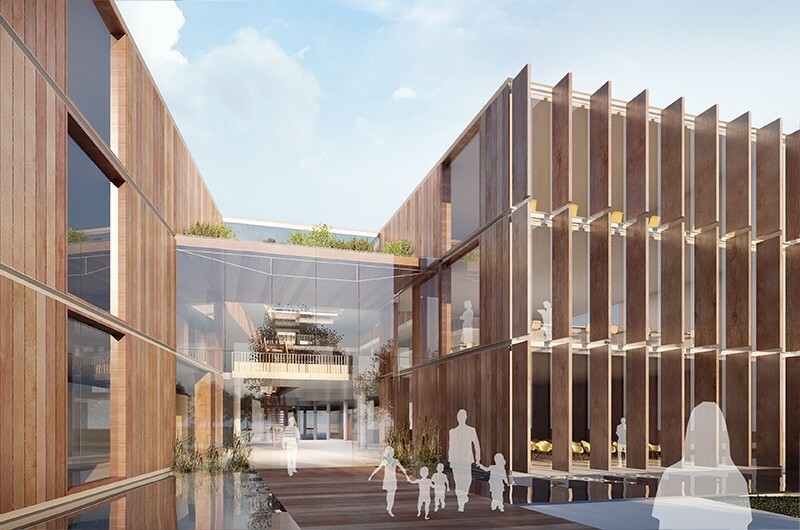 The primary functions of the building are arranged in two modular and efficient wings to either side and will contain research and teaching laboratories, offices, meeting rooms, lecture theatres, breakout spaces and a café and library. The flexible design embraces a holistic and long-term approach to sustainability and as such includes green credentials which will be both built into the fabric of the building as well as visibly apparent in its form and material. It has been designed to achieve a BREEAM Excellent rating. The £24 million facility will be constructed in two separate phases, one of 3660 m2 and the other of 3293 m2. Construction is anticipated to begin in June with completion intended a year later.